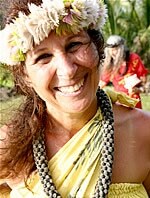 Jessi Keakawaiola Jardin started dancing hula in 1972 under the direction of Roselle Keli’ihonipua Bailey. After her initial ‘uniki in 1979, she began teaching in ‘Oma’o from 1991 through 2005. She served as the Vice President of the Board of Directors for many years and will be greatly missed.